This is my last posting from Bangkok for now. I will dedicate this posting to the public transportation of Bangkok. Bangkok has been famous for its traffic jam for years. I have lived here for 5 months. I can be a living proof that it is indeed very jam. However, to be fair, I think Bangkok has many types of public transportation to ease the traffic. Otherwise, I cannot imagine how bad the traffic can be! This is a good way to travel short distance. If you are lazy to walk for a distance of 15 minutes or longer, you can choose this as an option. Fare starts from 10baht and up. It is useful when your bus stop is at the main road and your house is way back in the alley. 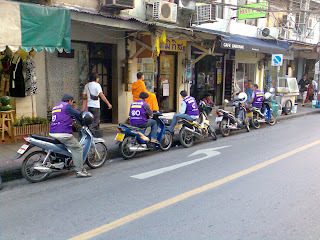 You can spot them by their colourful vests with Thai numbers are the back. It is one of the symbols of Bangkok. It is not the most comfortable transportation in my opinion and not that cheapest. But it does serve its purpose of bringing passengers from one place to the next. I love Bangkok taxis. They are everywhere and goes almost every where even to the nearby provinces. They are relatively cheap compared to taxis in other countries. The downside about Bangkok taxis is that they are very difficult to get during evening rush hour because the drivers have to return the cab to the companies. Some drivers drive like race car drivers. So, be prepared before you get on one. This is a small truck that is being converted into a small passenger bus. It has benches for passengers and room to stand. I find it a bit difficult for foreigners to take it as it is usually driven by non-English speaking drivers with no sign in English. Unless you are sure of your destination, it can be challenging. 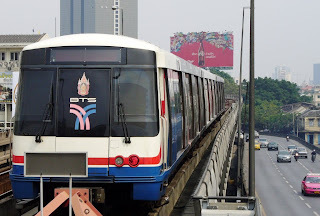 This is a fast way to travel between downtown Bangkok and the suburbs around Bangkok. It is fast and usually sit 14 passengers. Some of the vans are quite old and narrow seats. It has its route that it follows. 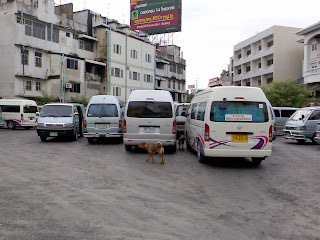 It is managed by the Bangkok Mass Transportation Department. 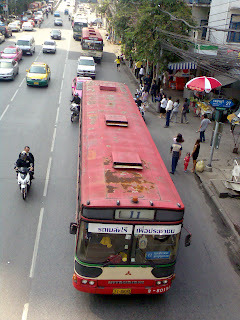 Public buses in Bangkok come in a few types and colours. Some of the buses look like 20 years old with no air-conditioner and wooden floor. 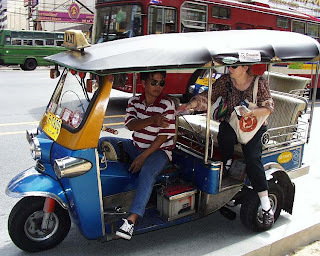 This is the cheapest way to travel in Bangkok for far. There are also air-conditioned buses just slightly more expensive than the old buses. These two train systems are the most popular, fast and comfortable way to travel in my opinion. They run fast and very frequently. Although it can get crowded during rush hours just like any other transportation, it is still the fastest way to travel. Bangkok has a lot of canals called 'Khlong'. The city makes full use of the waterways and provided motor boats as an option of public transportation. What a great idea and you can see why Bangkok is the Venice of the East. Most of the time in Bangkok I took the BTS, MRT & Taxis. I did once took the Tuk Tuk, trust me the driver drive like a race car driver too with 4 of us packed behind. 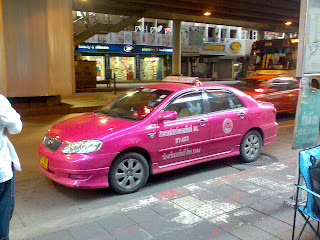 I like the taxis too, I did manage to took a pix of the pink taxi with a lot of hello kitty to it, so cute. But when they drive, they think they are F1 drivers. I thought I was the best driver here but when I'm Thailand, my friends say I sure lose to them. Even a old man driver in his 60s drive like F1 driver, can you imagine. The rest I never took simply because I think their transportation are good enough. Especially the BTS and MRT. such great intro by you to the public transport system of Thailand..... talking about "F1 cab drivers", Dubai taxis are equally crazy. actually that is an understatement, i should say most drivers including cab drivers in Dubai drives really fast - i suppose partly because the cars here are big compared to what we see back home. sometimes u feel like giving the cab driver a piece of your mind when the ride is super bumpy & jerky!